It all depends on who’s roasting it and how you order. Here’s to the many flavors of language, elevating the seemingly mundane into art, and having the appetite for a tasty serving of wit on rye.
. . . Salt and pepper? No lettuce. You got it.
. . . No salt, right? No, no pickle. Just tomato and mayo. Sally: I’d like the chef salad please, with oil and vinegar on the side and the apple pie à la mode. Waitress: Chef and apple à la mode. Sally: But I’d like the pie heated, and I don’t want the ice cream on top. I want it on the side, and I’d like strawberry instead of vanilla if you have it. If not, then no ice cream, just whipped cream, but only if it’s real. If it’s out of the can, then nothing. I love how Violi first draws us in with familiar New York deli speak, priming us for a punchline, then . . . oop! he swerves left into the fanciful and absurd. I love a good curve ball. 🙂 Two halves of a poem, two slices of bread, two kinds of language, dialogue both on point and on a par with each other. The poems simply happen. I can’t claim either spontaneity or discipline as virtues. I’m too impulsive and too patient. For instance, over thirty years ago I watched a counterman in a delicatessen make a sandwich. He did it with such impressive dignity, artistry and pride and served it with a manner that bordered on disdain, I knew I’d write about it. I just did, two months ago. It came out as a sort of skit. Wow, we have five giveaway winners this week — four for the Cookie Books by Amy Krouse Rosenthal and Jane Dyer, and one for Stand Up and Sing! : Pete Seeger, Folk Music and the Path to Justice by Susanna Reich and Adam Gustavson. Needless to say, we were keen to enlist the services of the dapper, always ravenous, charmingly erudite Monsieur Random Integer Generator, who was enjoying an extended Spring Break in Lahaina, Maui. While it was difficult to tear him away from his 4th luau this week, we were able to lure him to the Alphabet Soup kitchen with Amy’s favorite Peanut Blossom Cookies and a Seeger sing-a-long with Mr. Cornelius on banjo. After effortlessly consuming 153 cookies and singing Pete’s entire folk music catalog, M. Generator picked these names from his tophat. Please send your snail mail addresses to: readermail (at) jamakimrattigan (dot) com to receive your books. Thanks, Everyone, for entering these giveaways!! Keisha Shepard is hosting the Roundup this week at Whispers from the Ridge. 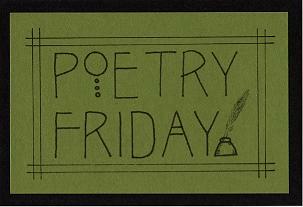 Scamper over there to check out the full menu of delicious poetic goodies on the menu. Have a nice weekend! Oh, so fun….but I WANT the pickle! LOL. I’ve not seen this poetry before. But, those sandwiches….even to this vegetarian…..look mouth wateringly good. Jama, you are always such a fun and interesting visit on Poetry Friday. Thanks for this delicious serving. I’m actually the same — it depends on what kind of pickle. No dill or sweet gerkins for me — I prefer bread and butter pickles. Wonderful to read. I love watching the counter people take orders, no eyelashes batted, they just roll with the orders. Experts! This also makes me yearn for later in the summer and those tomatoes! Thanks, Jama, a new poet and a food poem-all good! Yes, they are experts — and in NYC they’ve seen and heard everything so no eyelash batting required. 🙂 Bring on those beefsteak tomatoes! I’m tempted to try to make that roast beef on whole wheat sandwich with the lettuce splayed and the roast beef folded. Thanks for the inspiration. LOL — hope you do! I was thinking of doing the same thing. You know when your order is complicated like that, a mistake will be made! Gotta have the pickle and chips. That’s the best part! Can I have a root beer with that? Sometimes the simple order is harder to fill than the more complicated one. 🙂 Mmmm, root beer and chips . . .
I’d like to order a poem please (Isn’t that an echo from a Naomi Shihab Nye poem)? The Violi you served up today is just perfect! I love how the counterman hassles the guy who wants tomato, mayo and pepper, asking and re-asking, but bows to the architectural descriptions that elevates the sandwich to art. That is a counterman after my own heart. 🙂 Love the poem. These days, it’s the burrito guy I talk to with such intimacy. Oh my, a burrito guy! How fun! HA! I had a “Blue Ox” off the menu for dinner last night: Roast beef, sautéed onions, and crumbled bleu cheese on rye bread. Served with caraway horseradish sauce. Now I want to go to a deli and order something very particular! Your Blue Ox sounds yummy! The sauce on the side for me, maybe wheat instead of rye, extra onions, go easy on the bleu cheese. Served by Mr. Firth of course. The deli experience described in that poem makes me proud to be a native New Yorker. 🙂 Monsieur R.I. has been busy this week… someone should tell him not to sing with his mouth full, though. Perfectly scrumptious, Jama! You certainly know how to serve up such delicious poems. I loved the connections you made of this poem with “When Harry Met Sally,” and Abbott and Costello. The best part was hearing from Violi, “The poems simply happen.” Thanks for all Jama! I need to visit Katz’s! I have a relative who orders like this fellow in the poem and Sally, which drives me crazy. But Violi brings a sense of humor to it all – perhaps I should try that next time I dine with this particular picky eater. That sandwich looks delicious! Yes, you should do that — play a game of one-upmanship by ordering in a more complicated manner. Fun poem, Jama! I’m going to share it. I’ll take any of those sandwiches, so long as they come with a pickle. That is one hilarious poem – thanks so much for sharing it! Coming back late to take a bite out of this post, Jama. The dialogue in this poem communicates so much about New York culture and how people interact. And then that swerve into architectural flourishes! A good sandwich is constructed, not just slapped together. Thanks for sharing it.